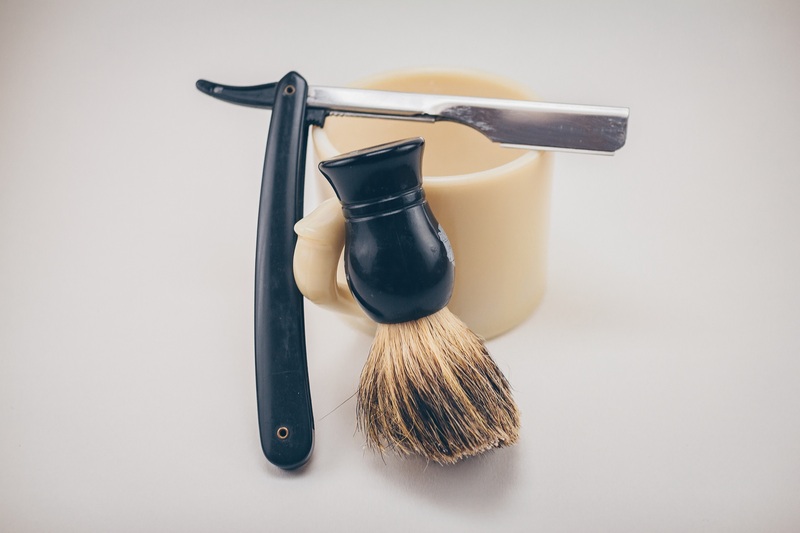 Most men, by the time their facial hair has found its mature growth, have figured out how best to manage the process of shaving their faces in a clean and consistent manner. Some, however, have never quite managed to master the art of shaving. Here are 10 signs that your man needs shaving lessons. Nickname. If If your man’s friends have given him the nickname “Patches,” and it has nothing to do with his clothes, it’s a pretty good sign that he could use some shaving lessons. Haunted Bathroom. If groans and curses, combined with the frantic rattle of safety razors and styptic pencils bouncing off of sink and floor, come out of the bathroom every morning while he’s shaving, he could probably use some shaving lessons. If your man happens to have a high tolerance for pain, or tends to suffer in silence, the next sign will provide visual evidence of his problem. TP Pox. If your man leaves the house every morning with little chunks of toilet paper stuck to his cheeks, looking from a distance as if he is growing little cauliflower plants on his face, there’s a good chance that he has not yet learned how to use a safety razor. Sideburn Asymmetry. Look closely at his sideburns. If one extends to the bottom of his earlobe, and the other extends only to the middle of his ear, shaving lessons for his next birthday may be in order. Forest Map.If your man’s face looks like one of those Forest Service aerial photos that show areas of clear-cut and remaining stands of old growth, he could use some lessons on how to take it all off. Lon Chaney. If you refer to your mate as “the man of a thousand faces” because his facial hair changes configuration on a daily basis, it probably means that he could be shown some more effective shaving techniques. Dandelion Fluff. If your man refuses to go outside when the wind is blowing and dandelions are releasing their seeds to ride the breeze, it’s probably because he did a crummy job shaving and wants to avoid having to pick all of that fluff off of his face. Mower-Blade Sharpening. If your next door neighbor brings his lawn mower blade over to sharpen it on your man’s chin, because his electric grinding wheel is malfunctioning, your man probably needs some pointers on shaving. No Slow-Dancing.If dancing cheek-to-cheek with your man means several days of looking as if you fell off a bike and made first contact with the pavement on one side of your face, your man definitely needs shaving lessons. No Fur Collars.If you’ve had to give up your favorite winter coat, the one with the beautiful faux-fur collar, because it acts like Velcro when it gets near your man’s face, it’s time to buy him a lifetime coupon for a daily shave at the local barber shop. There are other signs that your man needs shaving lessons, such as birds harassing him during nesting season, but these are some of the most common and easy to notice. If a number of them are noticeable on a regular basis, perhaps you should discuss it with him. However, be prepared for defensive remarks about how you shave your legs, in return. Previous articleConfessing Your Relationship Woes to an Online Confidant: When Is It Cheating?